The follow-on operation in Iraq is definitely not going well, which is evident even in those unusual times when we get to hear both sides of the story. But every so often something very positive happens that even the biased media can’t keep quiet. Such an event happened yesterday when according to news from Iraq, Abu Ayyub al-Masri, the head of al-Qaeda in Iraq, was killed in an "internal battle" between militants. 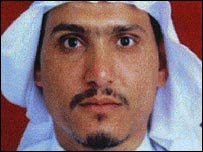 Al-Masri has led the group, which is blamed for or has claimed some of the bloodiest insurgent attacks in Iraq, since June 2006 when Abu Musab al-Zarqawi was killed in a US air strike. While it isn' t certain that al-Masri is dead, we can certainly hope this story is accurate, and until otherwise known. let's assume he is. These incidents are notable for a couple of reasons, first that another senior al-Qaeda operative has been eliminated, and second that they occasionally get their just desserts despite the fact that these cowardly leaders send out brainwashed men, women and children to do their dirty work for them. This event is noteworthy, but it isn’t cause for true celebration. It’s true that another brutal thug who doesn’t care who or how many people he kills has met a fitting end, but the reality is that some other punk will soon take his place.